Wesley West ER & Diagnostic Center, a campus of Wesley Medical Center, provides expert emergency, imaging and diagnostic services for west Wichita in a convenient location at Tyler and 13th. The 11-bed, free-standing emergency department is open 24 hours a day, every day of the year. It is staffed with experienced emergency physicians, nurses and other healthcare professionals, and it is equipped with state-of-the-art technology to help quickly and accurately diagnose and treat your emergent medical needs. 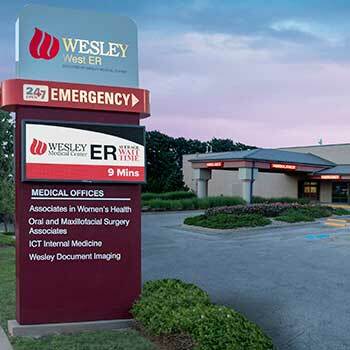 Wesley West is a part of the Wesley EmergencyCare Network, providing fast, close emergency care throughout Wichita. Wesley West is prepared to treat patients with any type of illness or injury, with the exceptions of major traumas, heart attacks, strokes and imminent childbirths. Patients arriving with these conditions will be quickly stabilized and transported to the most appropriate hospital. The facility also provides a wide range of outpatient imaging and diagnostic services. X-ray services are available at all times, with no appointment needed, and laboratory services as available from 7 a.m. to 7 p.m. daily, also with no appointment needed. Computed tomography, or CT, and ultrasound services are also available by appointment, which can be made by calling (316) 962-7900. Please check with your physician to see if Wesley West is an option for your diagnostic or imaging needs. Wesley West accepts most insurance plans, including Medicare.